If there is a bad recipe in Cook What You Love, By Bob and Melinda Blanchard, I have yet to find it. I turned to this one night when I needed to get dinner prepped ahead of time and only had a few boring boneless, skinless chicken breasts at hand. 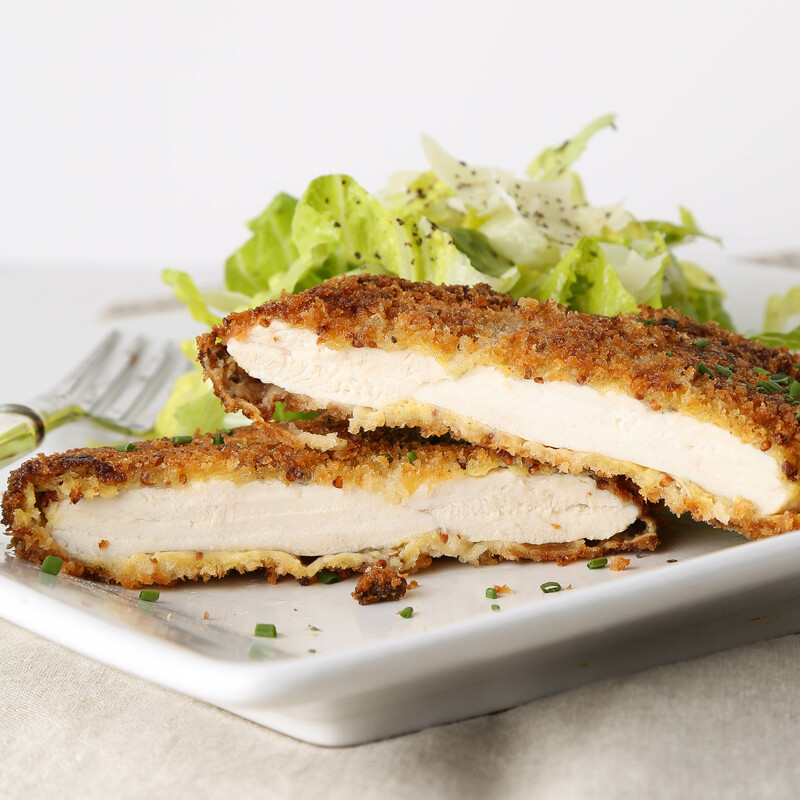 The chicken is coated in a mixture that includes two mustards. Look closely and you can see the seeds from the whole grain mustard…it seems like a lot and the coating mixture is thick, but trust me, it works. The flavors are spot on. Look for smallish chicken breast halves…I used Bell and Evans. For starters, they almost always taste best but also, by the time you pound them out and add the coating, even a small piece of chicken becomes humongous. Just a quarter-inch of oil and a non-stick skillet make this a super easy fried chicken dinner. 1. In a medium bowl, whisk together the mustards, egg yolks, and cream and set aside. 2. Place the flour, salt and pepper in a shallow bowl and mix well. Place the bread crumbs in another shallow bowl and set aside as well. 3. Trim the chicken breasts, cover with a piece of plastic wrap and using a meat mallet, pound each one to 1/4 inch thickness. Dredge each piece in the seasoned flour, shaking off the excess. Dip into the mustard mixture and coat thoroughly. Finish by coating with the bread panko, patting gently to adhere. 4. At this point, you can lay the chicken on a baking sheet, cover with plastic and refrigerate for several hours…or continue with the recipe right away. 5. In a large non-stick sauté pan, heat enough olive oil to cover the bottom generously over medium high heat. Cook the chicken, leaving it undisturbed until golden brown on each side and cooked through…about 3-4 minutes per side. 6. Serve with additional freshly ground black pepper and minced chives or parsley.